Home J & K Rath Transferred? Mattu responsible? Government Prepared To keep Looking In Other Direction? Rath Transferred? Mattu responsible? Government Prepared To keep Looking In Other Direction? Social media is buzzing with a rumour/news/discussion point, that Basant Rath, has reportedly been transferred and attached to Home Guards Commandant General Office while Alok Kumar is the new Inspector General Police of J&K (Traffic). The non-existent/missing directive supposedly came just a day or two after the controversial cop engaged in a Twitter banter with the newly elected Srinagar Mayor Junaid Mattu. In this much debated and discussed Twitter banter, Basant Rath had called Mattu a “cabbage” and earned a lot of flak, for being rude and disrespectful towards a public representative, from the netizens on social media, while a section definitely backed him up on this one too like for other of his antics. 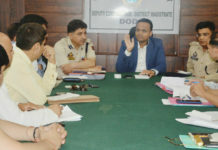 Basant Rath in another one of his tweets, after Mattu had criticized the traffic scenario in Srinagar claiming that the situation had not improved, told the Srinagar Mayor that traffic management was not his domain and suggested him to clear the mess within SMC. Social media is doing circles with conspiracy theories that it may be Basant’s ‘apparently’ tough attitude towards the affluent class which led to his transfer, however most of the netizens assume the reason to be his irrational behaviour towards general public, and a cowed down attitude towards big wigs and houses, studded in-between with carefully invented photo-op moments to show a tough stance against class A1 citizens too. Rath came on the scene as a peoples’ person in the state and was especially popular among the youth while his appearances at private functions, marriage ceremonies, sports events and other public events as well, made him appear to be a very firmly grounded , like-able, happy go lucky but a strict task master kind of a guy , the exact kind that was needed keeping in mind the deteriorating traffic situation in J&K and at the same time the turbulent and wounded population dynamics in the state. However, soon the social media presence became too much over bearing for the public and more for the officer himself as he seemed to have engulfed himself in the virtual life so much that he forgot the real part of his job and profile. The wedding visits and occasional gate crashing at public/private functions soon converted into a full fledged thrice a day selfie posing sessions with curious bystanders. Love him or hate him, you cant deny the fact that he invented what can be loosely called as policing on social media. Every post update of his did get him likes,reactions and he kept getting better at garnering them. And controversies had a fare share in the rise of his popularity. Negative publicity is publicity, after all. From PEOPLE’S COP to the most controversial officer, it was social media only that led the transition of image. Videos of Rath thrashing civilians black and blue for minor violations, damaging vehicles, making lewd and lascivious gestures, using abusive and obscene language started going viral one after another. Swayed by the support he received during his initial days, on social media, Rath took a wrong turn and started getting accused of harassing poor vendors and rehri walas, and at one instance he was accused of setting ablaze dozens of such road side “vending shops on wheels’ along with the fruits and vegetables they were selling, in Jewel Chowk area of Jammu. 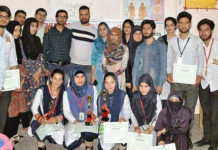 After that the videos of misadventures and over reach from Srinagar started doing rounds, which ranged from Rath being involved in street brawls, damaging dhabas and small tea stalls, to him being booed, hooted and jeered by angry youngsters who had been following him like a hero when he initially took charge as IGP and promised a lot on twitter and social media. The promises slowly turned out to be good one liners for internet consumption only. The transition in image was complete when Basant Rath took his role of judge, jury and executioner outside the virtual world of internet and thrashed a journalist, a senior one at that. And for the story to complete we are looking towards the ever so eloquent Governor Satya Paul Malik, who himself has assumed the office with a promise to be the PEOPLE’S GOVERNOR. Now will the government take any serious note of the issue, or remain happy in the fact that Rath is directing a lot of heat onto himself, thus wittingly or unwittingly taking the observing eyes of the lens away from many workings/non workings of the government. When has distraction not worked for the government? When has a distracted populace spoken for itself? Elephants galore, drums beat, gymnasts jumping from one rope to another, the stage was set for the master-magician to mesmerize the audience with his final trick, in-between a cute puppy-dog came playing with a football, rolling it ahead of himself then running after it, the kids in the front row ran towards the ball when it rolled off the stage causing a minor commotion in the hall. As the flutter subsided and everyone sat back in their chairs, a grim silence engulfed the entire seating area, pin drop silence, no one knew how it happened and when. The stage was empty, ropes were dangling from the roof, but the gymnasts were missing, smoke of the fire around which the dancers were swaying to the drum beats could only be smelt but not seen, no embers, elephants were too big to be hiding behind the curtains, everything from the stage had vanished and all there was on the stage for everyone to see – was the puppy-dog and the football. The illusionist had completed his trick. All he needed was the distraction.